According to iCIMS Chief Economist Josh Wright, the story of the U.S. economy in Q1 of 2016 was “underemployment” – and it’s a story that may not end with a new deluge of full-time jobs for all. Underemployment has been a problem in the U.S. since the Great Recession, and while full-time jobs are being created, they aren’t being created fast enough to change the overall composition of the job market. 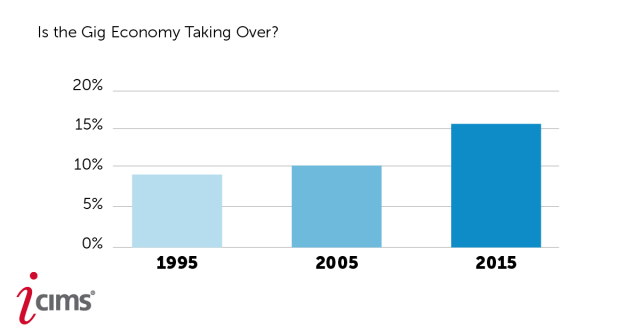 The proportion of available full-time jobs to part-time jobs and contingent roles hasn’t changed much. According to iCIMS’s recent Q1 Hiring Trends Report, it looks like the only way forward for today’s job seekers is to get creative. One such way that entry-level job seekers are getting creative is by focusing even more on internships than they did in the past. The number of internships being created is on the rise, but the demand for these internships is rising even faster. 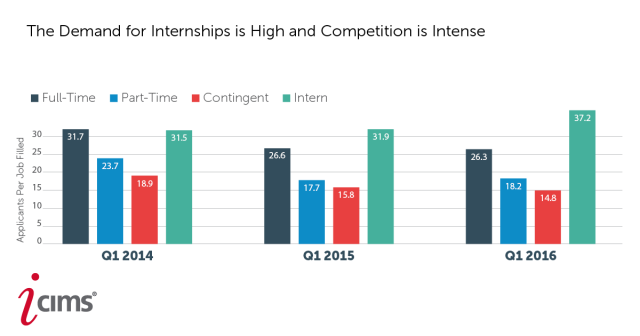 This fact becomes even more striking when one considers that the increasing number of internship applicants is complemented by a decreasing number of applicants for full-time positions. Pointing to the Bureau of Labor Statistics’ Job Openings and Labor Turnover Survey (JOLTS) data, Wright notes that, normally, the number of new job openings and the number of new hires track pretty closely together, as one might expect. Right now, however, they’re crossed over one another, and there are more job openings than hires. If today’s entry-level workers aren’t gaining the skills and experience they need to snag full-time jobs upon graduation in the education system, then it makes sense that more of them would try to gain those skills and that experience by taking internships. But is the skills gap the only thing driving more workers to apply for internships? It likely plays a role, but Wright says there are also other factors at work. Job seekers aren’t more interested in internships only because they need more preparation before entering the full-time workforce. They’re also interested in internships because outside of the internship system, full-time jobs are harder to come by. Many of these jobs have been replaced by part-time and contract positions, thanks to a globalized economy and rapid advances in technology. Wright believes this trend toward nontraditional forms of employment will only continue to grow as more and more businesses realize that they can use the Internet and mobile technology to more easily tap into on-demand labor. As a result, more people will create business models centered on this form of labor. “It doesn’t look like we’re heading back to the 20th century manufacturing model that supplied so many people with full-time jobs,” Wright says. Today, workers need to have more flexibility about how they approach their careers, both in terms of the types of positions they accept and the fields in which they work. They may have to turn to the gig economy to earn a living. This isn’t necessarily a bad thing. While some people are forced to become flexible because they can’t get the full-time jobs they want, others are embracing the gig economy and similar forms of nontraditional labor with open arms. But does the gig economy have the capacity to be a meaningful replacement for traditional employment? Will people still be able to live and afford comfortable lifestyles? That’s hard to say, because the data is sorely lacking. “There’s no question that we’re going to have winners and losers as we move to the gig economy, but judging the total number of winners vs. losers is going to be hard if we don’t even know what the size of the economy is overall,” Wright says. Wright has seen estimates of the size of the gig economy that range from 5 to 30 percent of the U.S. labor force. For that reason, he calls the gig economy “the dark matter of the U.S. labor economy”: It’s all around us, but we can’t really pin it down just yet. “It speaks to the pressing need to have better data in order to make better decisions, whether you are an individual job seeker, or an employer, or a policymaker,” Wright says. One hopes our political leaders are listening.